Somewhere within Catherine Hardwicke's Red Riding Hood lies an adequate anxiety-driven gothic mystery, accentuated with Brothers Grimm-caliber whimsy and contemporary polish. 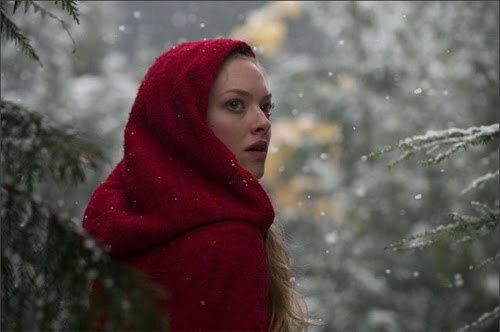 A fine snowy setting populated by dark-wood cabins dominates the image, while suitable casting choices -- focal being Big Love's Amanda Seyfried -- offer their services in breathing life into the whimsical town of Daggerhorn, a village plagued with unease over the presence of a voracious wolf looming in its outlying forests. However, the trendy flamboyance and sturdy cast materialize into a tepid mess through the Twilight director's eye, letting a scrap of promise slip through its fingers by way of obnoxious scripting and a dithering, dull focus on the chemistry generated between its leads. Little Red Riding Hood's simple cautionary tale holds a lineage of loose adaptations, passed down from medieval peasants to Charles Perrault and the Brothers Grimm. Taking a few liberties with the premise feels welcome in the hands of Orphan screenwriter David Johnson, whose script gives Red Riding Hood a name, Valerie (Seyfried), and draws up the Daggerhorn village as a bucolic nook in a forest, one that offers livestock sacrifices to a bloodthirsty, almost curse-like wolf. But I guess the paranoia following a gory death at the hands of the beast, heightened by witch-hunter Father Solomon (Gary Oldman) charioting into town and claiming that it takes human form during the day, isn't enough; it also forces a love triangle within the town's suspicion, between Valerie, a poor woodcutter named Peter (Shiloh Fernandez) she's loved since childhood, and wealthier blacksmith Henry (Max Irons) that her family -- father Cesaire (Billy Burke) and mother Suzette (Virginia Madsen) -- have arranged for her to marry. Red Riding Hood generates a little allure with its updated gothic premise and a glossy artistic eye, a prime setting for the cast to muster an energetic fantasy-horror tale. Shot in Vancouver, the location of Daggerhorn nestles into trees and snowy banks, while Australia cinematographer Mandy Walker fluidly moves the lens over log homes and bursts of color -- snow-laden blues, earthen warmth, and the red of Valerie's cloak -- to create a thriving rustic aesthetic. Amanda Seyfried gallivants through the forbidden forests and between the dimly-lit locations, eventually bathed in deep crimson to signify all the faint prescient symbolism culled from the original story, and her wide-eyed, soft-voiced poise meshes smoothly into the befuddled Valerie. Virginia Madsen stands out as a fine choice for her mother as well, while Gary Oldman should wear the over-the-top preaching that spills from a werewolf hunter like a glove. The components are there, down to Alex Heffes' and Brian Reitzell's snappy rhythmic score. Underneath questionable direction and the way Hardwicke navigates an ill-defined script, Red Riding Hood lethargically slumps into tedium. Honestly, the village's atmosphere drew attention at first, generating an inkling of curiosity at the sight of a goat chained up alongside a makeshift moon calendar, heightened by the protective spikes jetting from Daggerhorn's structures. Even though the film lazily shapes the wolf into a current pop-culture-friendly werewolf, the anxiety that initially knocks the town's populace into an uneasy state flirts with Wicker Man-esque eeriness. Yet a consistent stream of blunt dialogue awkwardly hangs in the air -- Valerie's wood-cutter beau lustfully exclaims he could just "eat [her] up", among others -- and any of that naturally creepy flow gets lost in its own stiff atmosphere, draining the color from its cheeks. It's saying something if even Gary Oldman's exaggeration appears lethargic and chained down. Instead of sustaining Daggerhorn's werewolf-saddled misgivings, the tone Hardwicke builds atop it can't resist from refocusing towards the angst-hampered romance. Red Riding Hood aims to balance supernatural doubt with swooning as Valerie suspiciously darts her eyes amongst the town's citizens and back to her beaus, and it doesn't seem to realize that it's turning a cold shoulder from its more thrilling draws and towards muddled clichés. 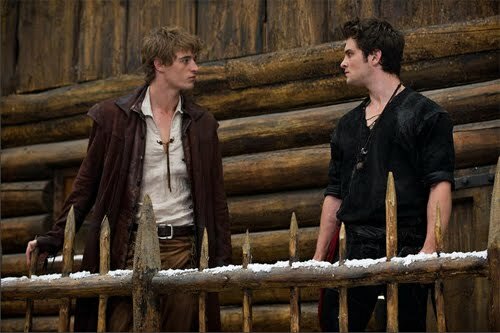 Her warring chiseled-jawed hunks generate a wishy-washy mood not unlike the brooding in Hardwicke's Twilight, while falling into the archaic battle of rich man-poor man where a matronly girl wrestles with choosing between matters of the heart and parent-propelled financial security. This triangle wouldn't be any great shakes even had it been aptly handled within the whodunit mystery's confines, but Amanda Seyfried's carriage saunters between two wooden suitors, thickening the blandness with a tedious parlay of testosterone and medieval manner. The result, even while picking up the pace and latching onto action near the close, is an unfocused jumble that neither evokes the passion it perceives itself to have nor offers even meager jolts, making Red Riding Hood an eye-catching but tiresome slog. Twists and turns occur, while a computer-generated wolf eventually tears into the flesh of Daggerhorn's citizens during the "blood moon", only in the ways a PG-13 film can muster. Just for kicks, it also scratches off flickers of the fable's lore -- the way the wolf communicates with the young heroine, the ridiculous "My, what big eyes you have" scenario, and the temerity the filmmakers deemed tolerable for the story's twisted conclusion in Grandma Julie Christie's house, filled with blood, claws, stones and operatic flourishes. Yet it all feels like a massive pulled punch, with everything from the visual design and actors to the overall tone captured in a leaden state, almost begging to be handled in a more raw, vivacious, and ... well, engaging fashion.